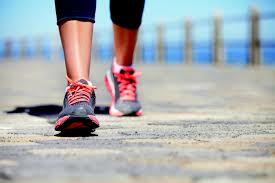 Whether walking, jogging or running, going around on foot is great. Time spent outdoors in the cool Scottish air is invigorating for the mind, body and soul. You will also help the environment by lowering your carbon footprint. You can travel by foot as part of a daily commute, a trip to the shops or as a leisure-time activity. It can be an activity completed multiple times a week or once in a while. There is minimal equipment or cost requirements to walk, jog or run. The freedom this allows is one of its many benefits. If this hasn’t yet inspired you to pop on your trainers and bounce outside, there are multiple websites explaining the many benefits walking, jogging and running (blog) bring. Just click on the hyperlinks to find out more! New to walking or running? Here are some walking and running tips from the National Health Service (NHS) to get you started. Walk, jog or run over the Fife Coastal Path. Some other good walks include those listed here. Open to all University staff and students, this group organises a short walk in the town once a week. For more information, please see the St Andrews WWOW website. The University of St Andrews Hillwalking Club. For more information, please see their website or Facebook group. This is only the beginning. More inspiration is only a quick Google search away!